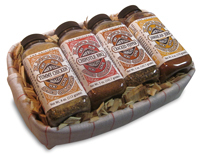 BBQ Seasoning Gifts For Father's Day! Gift baskets Includes gift card. Fill it out at check-out in the "Extra Customer Data" section. Gift baskets ship 3 day priority mail and only within continental United States. Father's Day is a day of commemoration and celebration of Dad, your Father. Not only honor and pay tribute to your Father, but all men who have acted as a father figure in your life, maybe your Stepfather, Grandfather or even a big brother or Uncle. 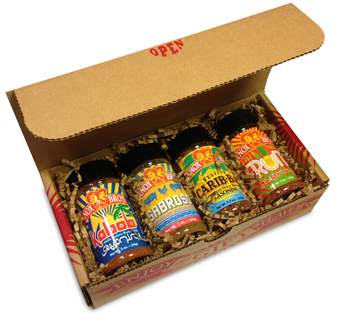 June is when Father's Day happens and a perfect month to receive a BBQ seasonings gift as summer is right around the corner. 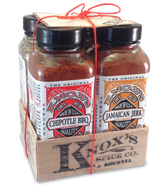 Knox's Spice Company has created BBQ seasoning gift baskets with our dry rubs just for the Dad that loves his bbq and grilling. When most Fathers are weeding through chocolates and trying on ties yours will be in the yard firing up the grill. He may even be using the basket to light the coals. After he removes the dry rubs and hickory chips, of course. This unusual bbq gift basket, with our dry rubs and hickory chips, is a special gift that keeps giving. Different from traditional baskets that are full of snacks or "gourmet" products, our uncommon basket was designed specifically for the father who loves their grill. 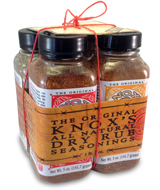 Knox's dry rubs and hickory chips provide all the flavor he will need to make some excellent memories of tasty grilled foods. Your bbq gift basket of flavor will not soon be forgotten and every time he makes a tasty treat he will think of you, bonus! The Rubs & Chips gift baskets is Knox's dry rubs packed in hickory chips in a kitchen towel lined basket. Why the kitchen towel, because he will need it. Combine all that flavor with a couple pounds of beef, chicken or pork, and you will have created fond memories of some truly excellent eating. You may even be invited to enjoy it with him and get a really nice meal out of it. Possibly Cracked Pepper Sirloin or maybe even Chipotle BBQ ribs or brisket. Make sure to type in what you would like to say on the card when ordering. 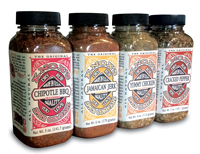 All 4 Knox's Spice Co's bbq seasonings. Carefully arranged in a kitchen towel lined basket and packed with hickory chips (that are for smoking meats), shrink wrapped and tied with a red cord. Personalized card and recipes supplied. 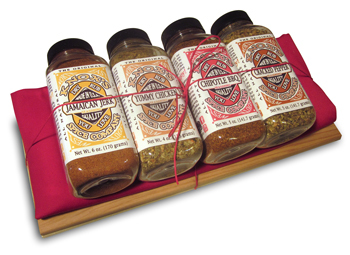 Our 4 dry rubs (Chipotle BBQ, Cracked Pepper, Jamaican Jerk & Yummy Chicken), a heavy duty red apron and 2 cedar grilling planks (12" x 5"). Personalized card and recipes supplied. The first Father's Day celebration in the United States was in West Virginia, July 5, 1908. Initially a church service held at Williams Memorial Methodist Episcopal Church South (currently called Central United Methodist Church). Conceived, after a mine explosion that killed 361 men, by Grace Clayton. Grace presented the idea of a service to the Pastor to celebrate the lives of the miners who died in the explosion. A very touching notion. The officially recognized holiday was pushed into the spotlight by Mrs. Sonora Dodd of Creston, Washington. Mrs. Dodd, inspired by efforts to establish Mother's Day, began to promote the holiday. Initially it was suggested to celebrate Father's Day on June 5th. This date signified the day of her Fathers' death, a Civil War Veteran. The date was then moved to the third sunday in June as there was not enough time for organizers to prepare. Spokane Washington officially held the first Fathers Day on June 19, 1910. Two years after the first sermon in West Virginia that sparked the holiday for Dads. Recommended as a National Holiday by President Calvin Coolidge in 1924 but not officially recognized until 1972 during the presidency of Richard Nixon. So the celebration of your Dad was 64 years in the making, you should tell him how much he matters and spend an afternoon or a weekend with him because it is his day. If you know your Dad you probably know he may not ask for much from his children, or maybe he does, which should make things easier. Most Dad's are happy if you just let them do what Dads do, whatever that may be. To buy the perfect gift for Dad you need to know what he likes and this may not be easy. Most guys, Father's or not, might enjoy something and not really share the joy. Does your Dad like to cook? If so you may have already found his gift, above. Does he like sports or hunting? Again, see above. If you know what he enjoys than you surely will find a unique gift that he will not buy for himself. If he complains, listen. Maybe he does not complain much so you will have to pay extra attention. Maybe he complains a lot, still listen. Does he grill out or cook a lot, maybe a new cookbook or a digital thermometer or a Chef's Knife or a dry rub gift for BBQ. A sharpener is a big hit as guys love tools and a tool that makes his other tools better is a good thing. Men like useful gifts. Cloths are good but most men only require a couple of ties and it was not for being around other people would probably wear the same cloths or no clothes :-). Does Dad enjoy some down time? The best gift is to find out what his chores are and take care of them for him or maybe a service like window cleaning or gutter cleaning. Do not under-estimate the power of taking care of a chore for a guy just make sure it is not something they enjoy doing. Gifts that make a man's life simple or easier are always good even if they seem like simple gifts.